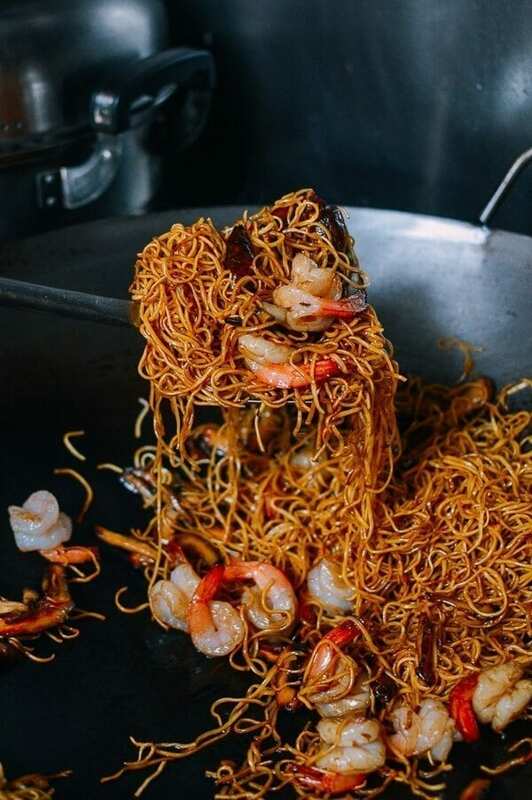 Hong Kong-style Shrimp Chow Mein Noodles are a classic Chinatown favorite. 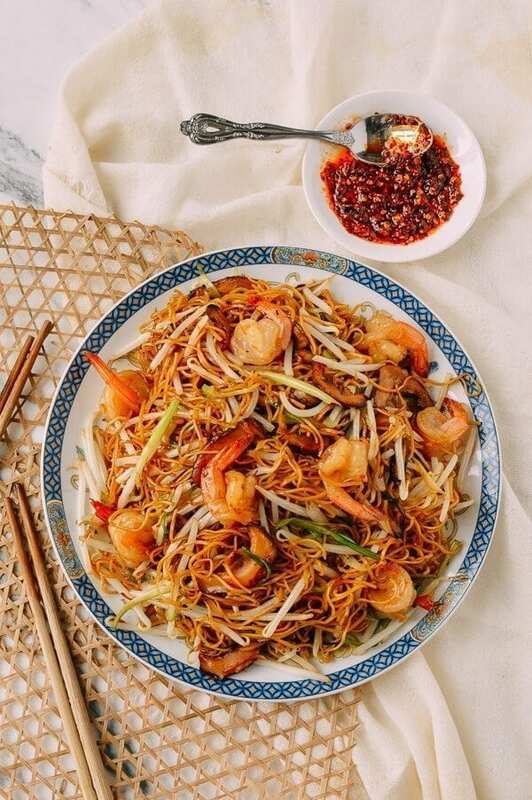 Slightly crispy and chewy pan-fried noodles combine with umami flavors of shrimp, Shiitake mushrooms, fresh mung bean sprouts, and scallions––everything gets tossed into a hot wok, to get the true MVP ingredient: that wok hay flavor. Here on the blog, we make a concerted effort to keep tabs and running lists on all of the dishes you request, from the familiar to the obscure. 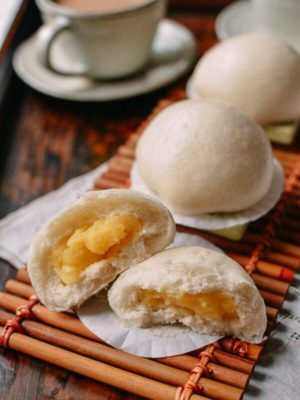 We’ve gotten lots of requests for tasty dishes people have eaten at hole-in-the-wall places in Asia that folks are hoping to recreate at home. 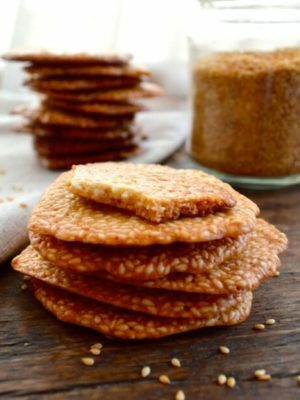 The impetus for this recipe was one such request, and we’re pretty happy about it! 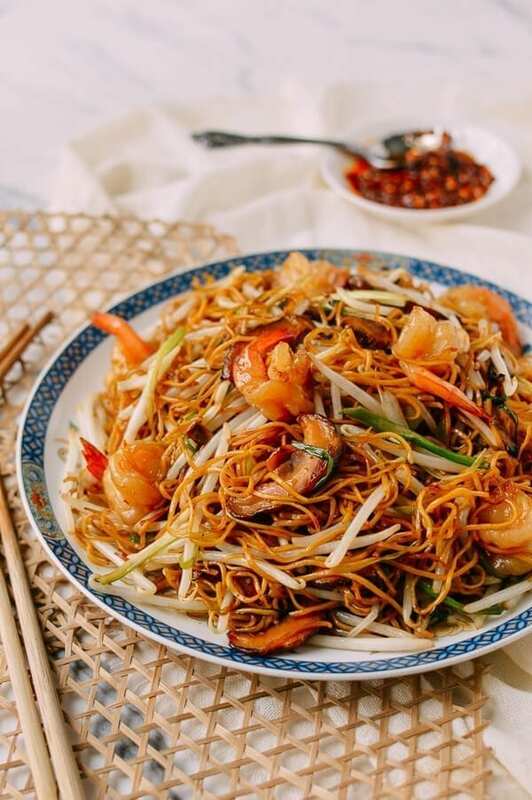 It has been a long while since we’ve made a pan-fried noodle dish, but this recipe request came from a reader looking to step up his game and make the move from ordering his favorite Cantonese Hong Kong chow mein dishes at a restaurant to whipping them up at home. 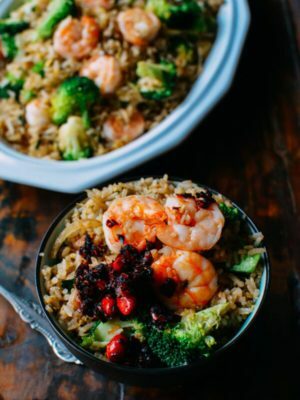 While we’ve covered other pan-fried noodle dishes like Chicken Gai See Chow Mein and Honey Hoisin Pan Fried Noodles, this version with shrimp is a new favorite! 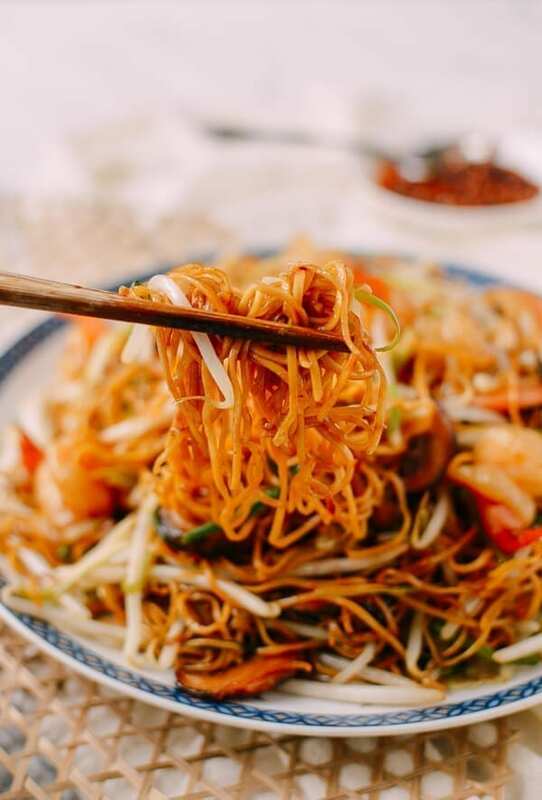 These Shrimp Chow Mein Noodles come together quickly once you prepare the fresh ingredients, but there’s one vital detail to keep in mind as you turn to your wok. 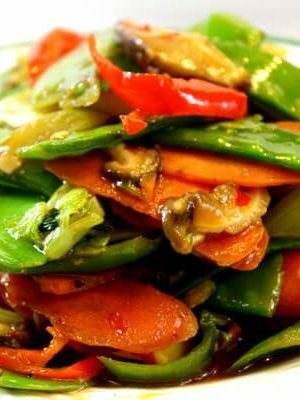 To get it right at home, you’ll need a crazy hot wok to emulate that seared wok hay flavor everyone craves from their favorite Chinese restaurant. Let us know if you’re successful in the comments! 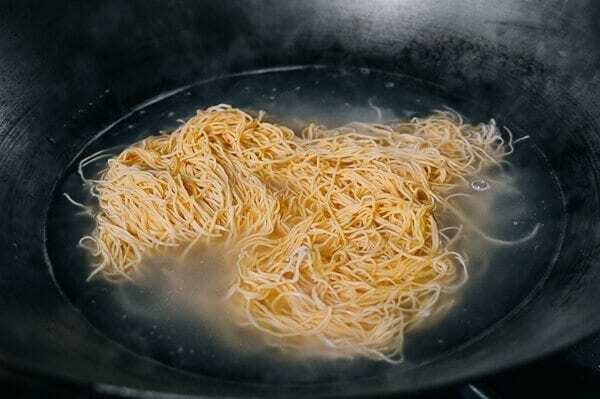 Bring 2 quarts of water to a boil, and cook the noodles for 1 minute. Drain, rinse in cold water, and spread the noodles out to drain further. I recommend that you use uncooked, cleaned frozen shrimp. 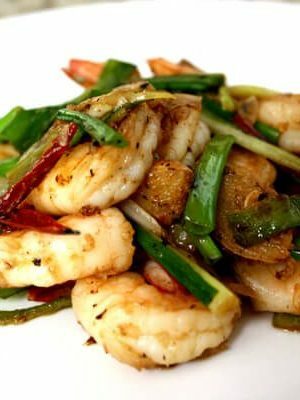 For this Shrimp Chow Mein recipe, I used uncooked shrimp, peeled off the shells, and left the tails on. 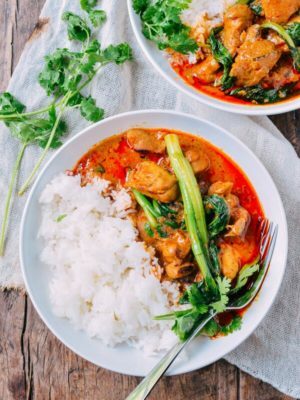 The tails add nice flavor to the dish, but you can remove them if you prefer. 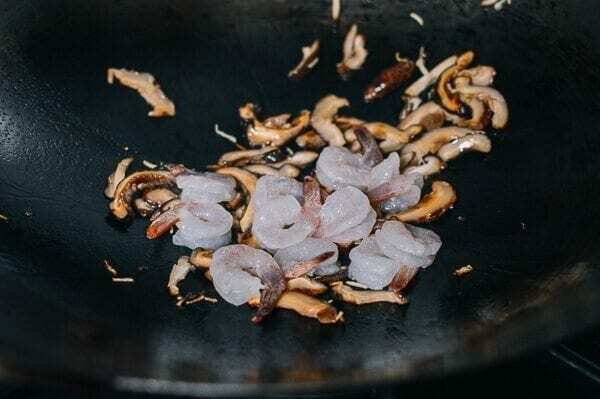 I also like to butterfly the shrimp: use a sharp knife and carefully cut about two thirds of the way into the backs of each shrimp to do this. Next, toss the shrimp in 2 teaspoons of oil, a pinch of salt, and 1 teaspoon of cornstarch. Set aside. Rinse the mung bean sprouts in cold water. Keep them in cold water until you are ready to cook, and put them into a colander to drain just before you heat up the wok. 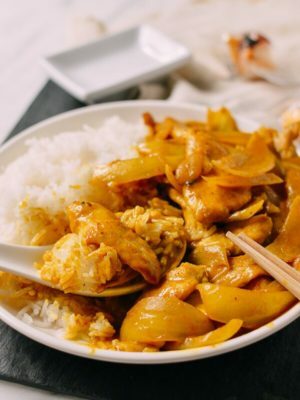 In a small bowl, mix the hot water and sugar until dissolved, and add the soy sauces, sesame oil, oyster sauce, 2 teaspoons Shaoxing wine, and white pepper. Set aside. 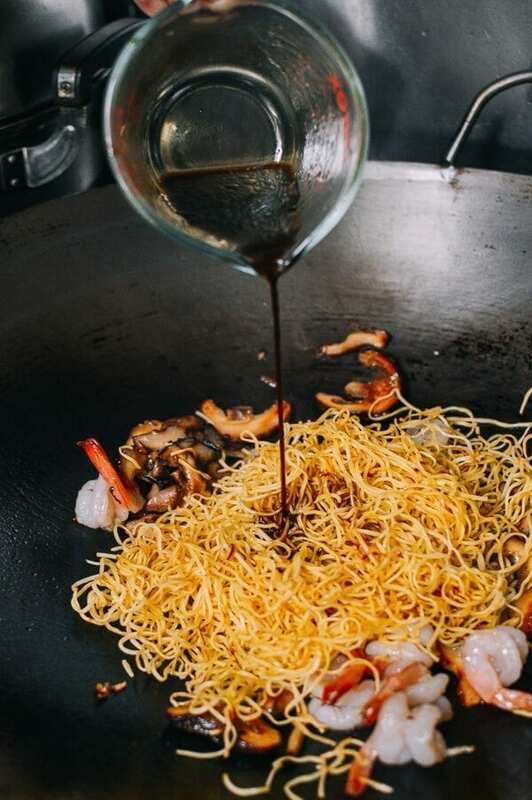 Heat your wok to medium high heat, and add 2 tablespoons of oil to coat the wok. 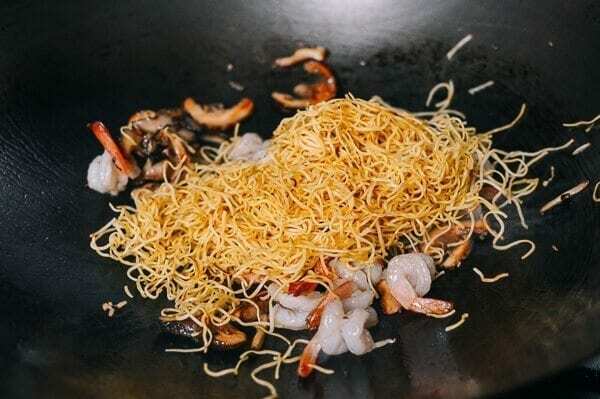 Spread the noodles in a thin, even layer, tilting the wok in a circular motion to distribute the oil and crisp the bottom layer of the noodles evenly. 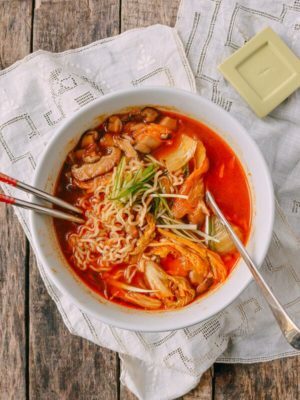 Let the noodles cook for 1 to 2 minutes, and adjust the heat as needed–lower if the noodles start to scorch or higher to lightly brown the noodles. The wok should not be smoking at this point! Flip the noodles over, and add another tablespoon of oil around the perimeter of the wok to let the other “side” of the noodles crisp. Don’t stress if you can’t turn the noodles over in one shot, The goal here is just to get an even, light crispiness during this cooking stage. 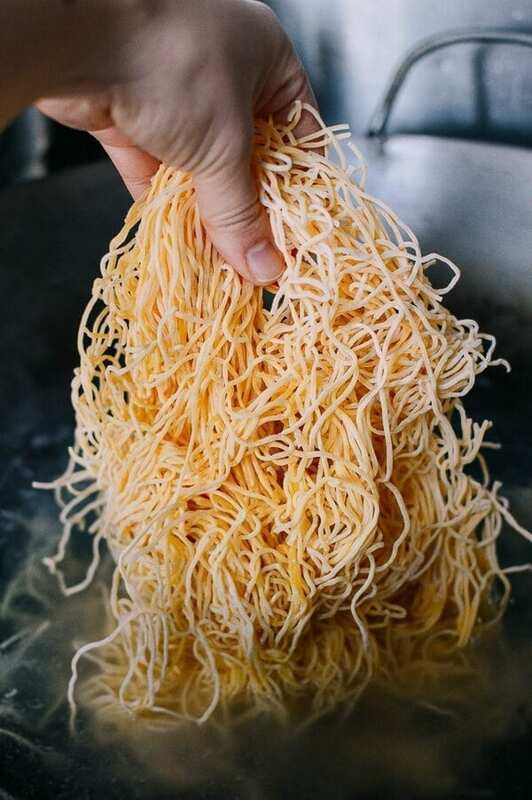 After 90 seconds, flip the noodles again and you should start to see a light browning of the noodles, with some areas where the noodles are crispier. 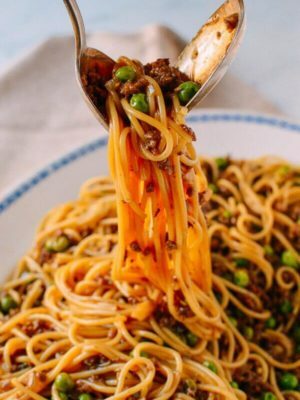 Cook for another 2 minutes, flipping the noodles again, and transfer them to a plate. 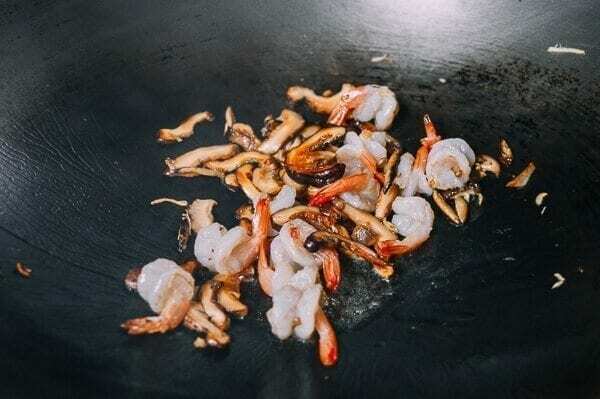 Heat the wok to medium high, and add 1 tablespoon of oil to coat the wok. 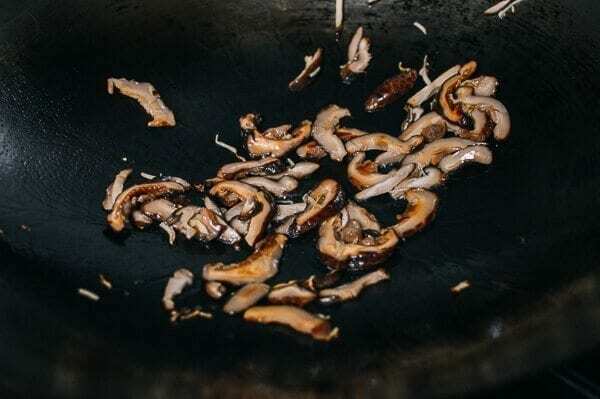 Stir-fry the mushrooms for about a minute, then push the mushrooms to the side, and turn the heat down to medium. Add another ½ tablespoon of oil in the middle of the wok, and add the julienned ginger to the oil. Let the ginger caramelize for about 15 seconds. Next, add the shrimp and stir-fry for 15 seconds. Turn the heat up to high, and add 1 teaspoon of Shaoxing wine. Stir-fry for another 45 seconds, until the shrimp are about 80% done. And pour the soy sauce mixture over the top. 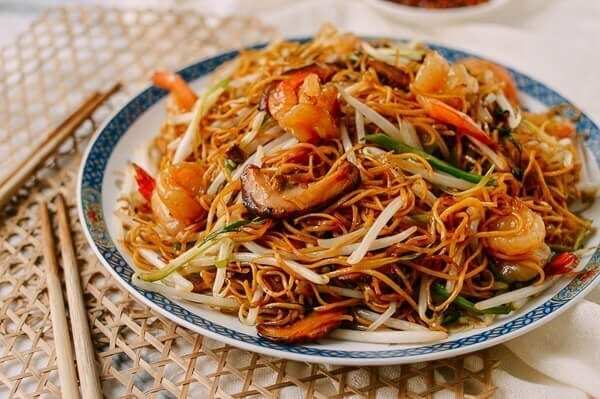 Quickly stir-fry the noodles with a lifting motion until the sauce is well-incorporated–about 30-45 seconds. 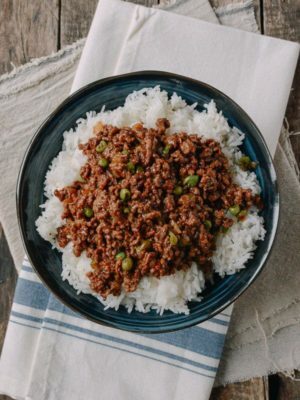 Toss in the scallions and the mung bean sprouts, and stir-fry everything for another minute. The wok should be at its hottest now to help you achieve that wok hay flavor. Transfer the noodles to a serving dish (before the scallions and bean sprouts wilt–they should still be somewhat fresh and crunchy). 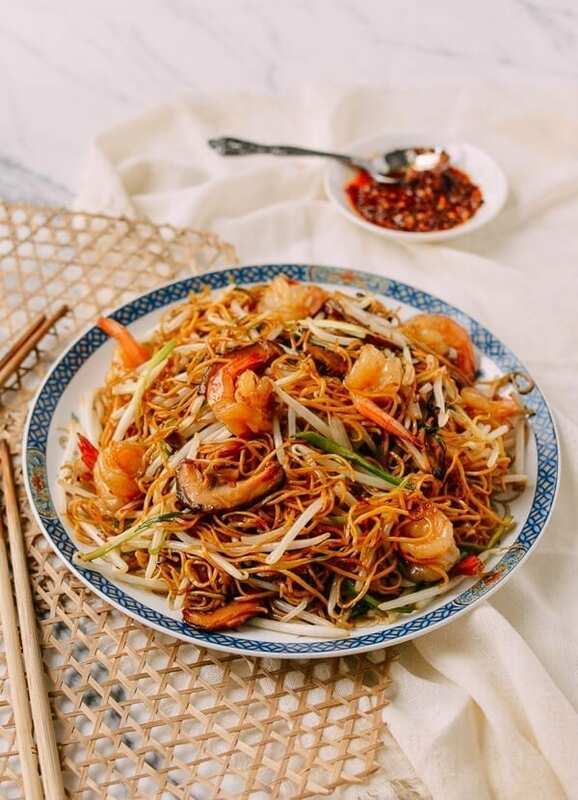 Serve this Hong Kong Style Shrimp Chow Mein with your favorite homemade hot chili oil or homemade Chiu Chow chili oil! 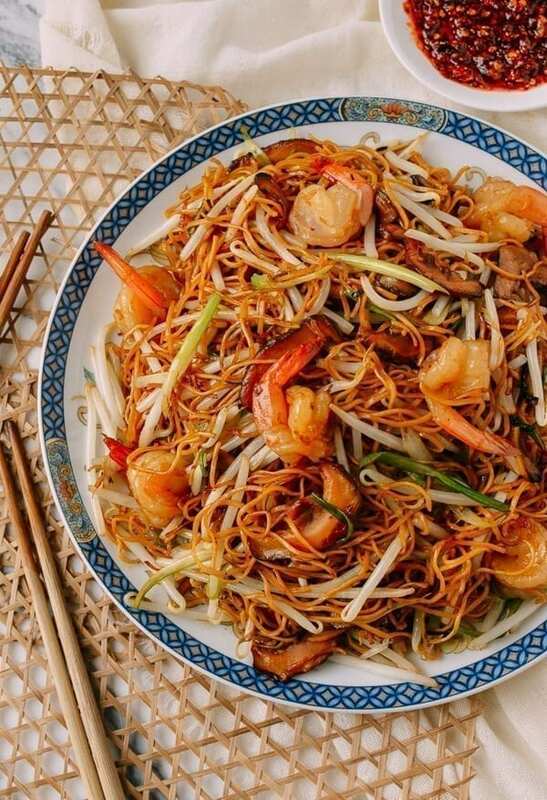 Hong Kong-style Shrimp Chow Mein Noodles are a classic Chinatown favorite. 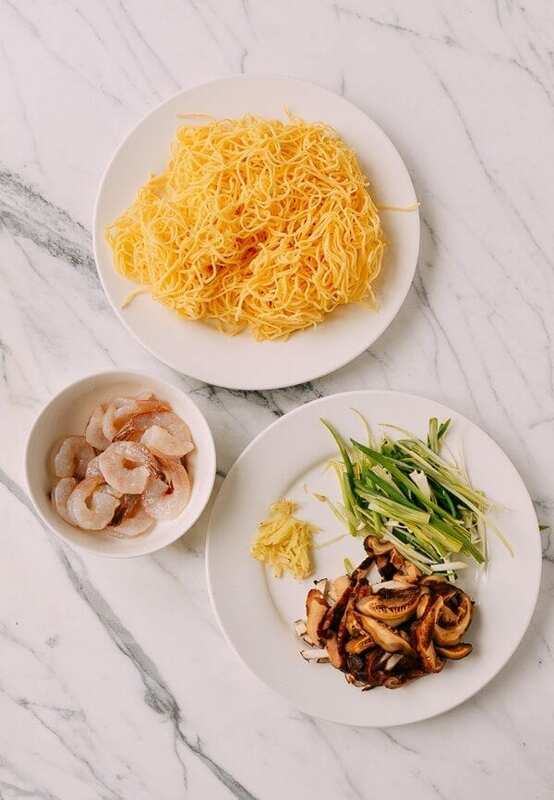 Slightly crispy and chewy pan-fried noodles combine with umami flavors of shrimp, Shiitake mushrooms, fresh mung bean sprouts, and scallions––everything gets tossed into a hot wok, to get the true MVP ingredient: that wok hay flavor. Allow 1 hour to soak the dried shiitake mushrooms if using. Bring 2 quarts of water to a boil, and cook the noodles for 1 minute. Drain, rinse in cold water, and spread the noodles out to drain further. 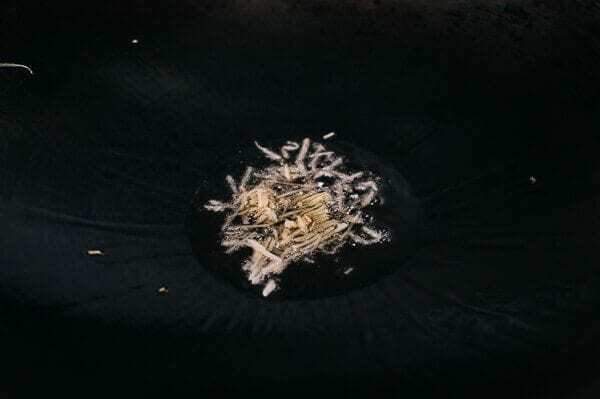 Spread the noodles in a thin, even layer, tilting the wok in a circular motion to distribute the oil and crisp the bottom layer of the noodles evenly. Let the noodles cook for 1 to 2 minutes, and adjust the heat as needed--lower if the noodles start to scorch or higher to lightly brown the noodles. The wok should not be smoking at this point! Add another ½ tablespoon of oil in the middle of the wok, and add the julienned ginger to the oil. Let the ginger caramelize for about 15 seconds. Next, add the shrimp and stir-fry for 15 seconds. Turn the heat up to high, and add 1 teaspoon of Shaoxing wine. Stir-fry for another 45 seconds, until the shrimp are about 80% done. Add the noodles, and pour the soy sauce mixture over the top. Quickly stir-fry the noodles with a lifting motion until the sauce is well-incorporated--about 30-45 seconds. 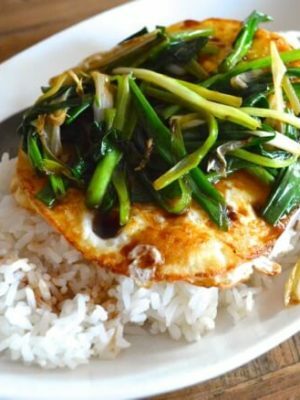 Toss in the scallions and the mung bean sprouts, and stir-fry everything for another minute. 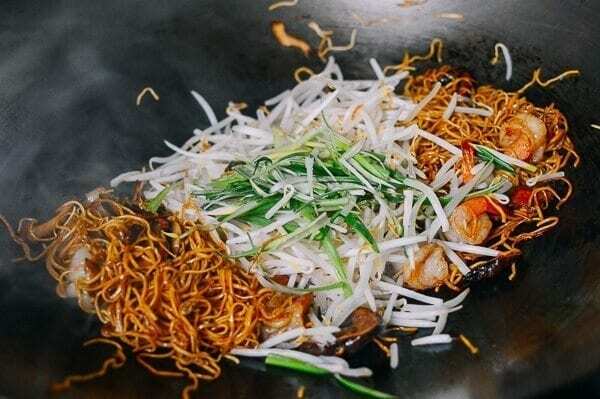 The wok should be at its hottest now to help you achieve that wok hay flavor. Transfer the noodles to a serving dish (before the scallions and bean sprouts wilt--they should still be somewhat fresh and crunchy). Thanks Michael, hope you enjoy it! 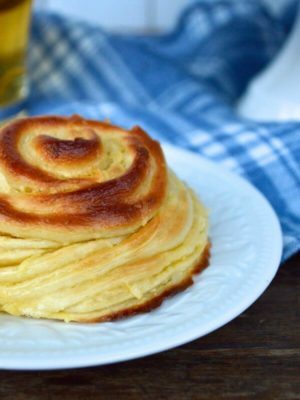 Oh my, what a great recipe! 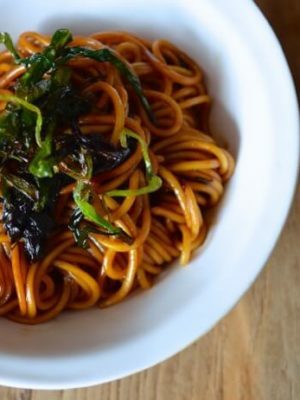 The crispy, chewy noodles, are the star in this one! I used a full 10 oz. 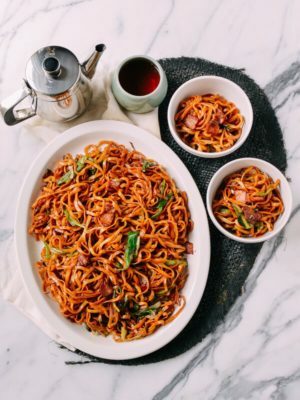 package of regular low mein noodles, cooked al dente, rinsed and refrigerated overnight, then crisped up good in a very large non-stick fry pan. I subbed the mushrooms I had on hand, and went with a full pound of small shrimp. Sauce was perfect, but next time i would use more vegetables for this quality of noodles/shrimp. Also added a teaspoon of msg to the sauce. 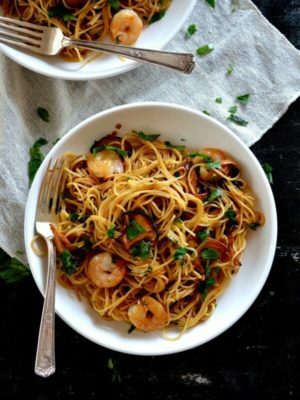 Next time, i may try this with scallops! Thanks for the great recipe! I have dry Hong Kong style noodles rather than fresh. Can I still make this? Yes, you can, Anna! Precook the dried hong kong noodles as you would with the fresh noodles. Thanks! My husband and I made it tonight and everything was great except for the noodles. There were way too many for the sauce. I used most of a 9oz package of dried noodles, but now I’m wondering if the ratio of dried to fresh isn’t 1/1. Btw, I LOVE your site! My husband has always wanted me to learn to cook authentic Chinese and this is the first time I have felt like I can! Hi Anna, the weight of dried noodles and fresh noodles is definitely different. I should have reminded you in my previous comment. Please do try the dish again with less noodles. I did make it again tonight with about half as many noodles as last time and it was delicious! The noodles were actually able to crisp and the noodles/sauce ration was much better. 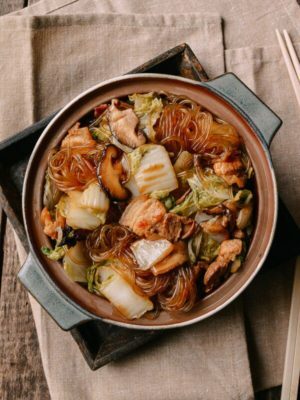 Unfortunately, the mung bean sprouts I bought had gone bad already, but I substituted some leftover wood ear mushrooms and bamboo shoots and it still turned out great. 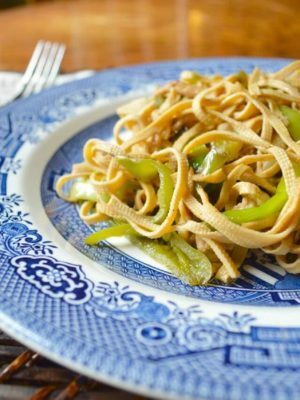 My husband hadn’t told me initially but he really dislikes chow mein he’s gotten at some restaurants, but he wants me to make this again! Hi Anna, excellent to hear it!